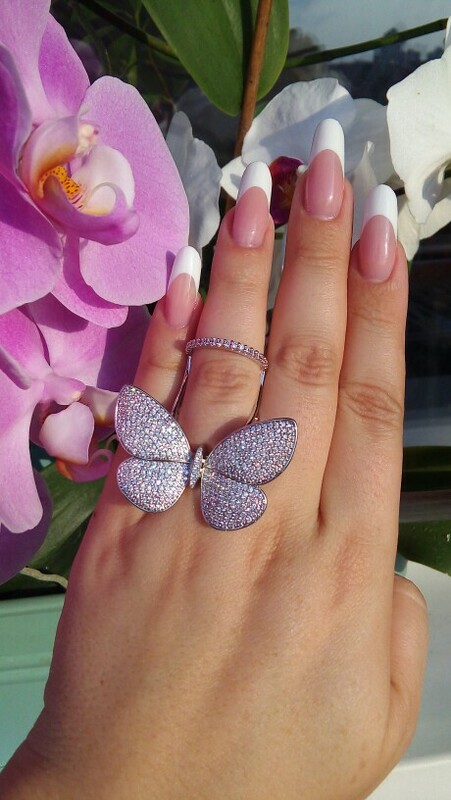 The Moving Wings Sparkling Crystal Butterfly Ring is an accessory crafted by our finest artisans with practiced accuracy to ensure the best quality possible. 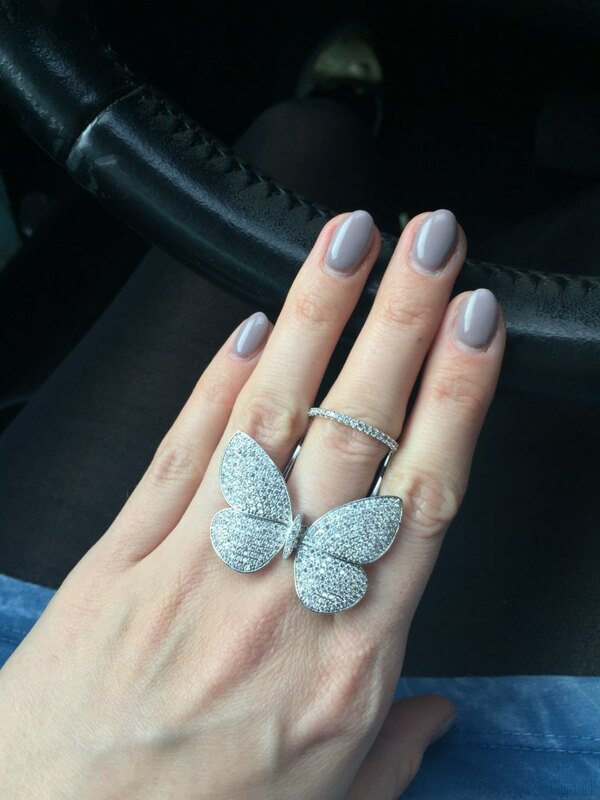 Embedded in a paved setting, fine-grade AAA+ Austrian crystals cover up the whole butterfly to give this beautiful ring an aura of sparkling lightheartedness. Polished twice, using German polishing and hand-polishing, to achieve an even shine! 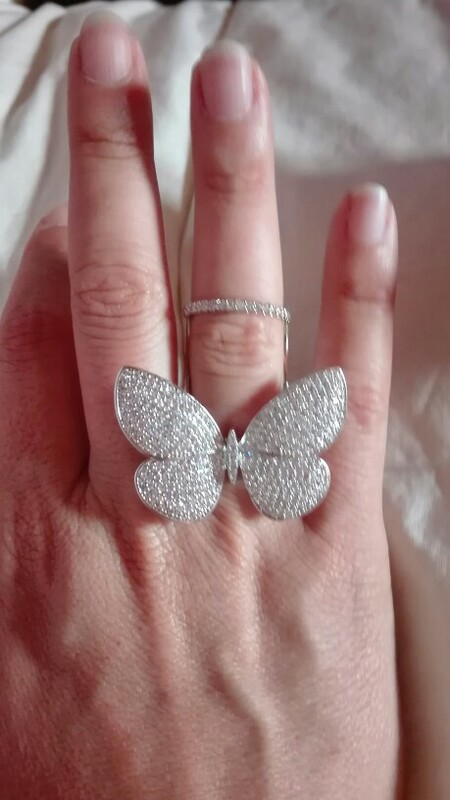 The wings of this butterfly ring flap and mimic a butterfly's flight every time you move and flex your finger! Butterflies are more than just delicate little beauties that give color to our surroundings. In Ancient Greece, these winged creatures symbolize one's psyche, soul, and immortality. Some other cultures perpetuate the butterfly as a symbol for change, transformation, and transcendence from a physiological consciousness to a spiritual level of consciousness. Sit there looking pretty for we have FREE WORLDWIDE SHIPPING! I ordered the second one for my friend. It's just simply beautiful. very beautiful. took 19 9, perfectly fit. Wow! I am amazed at this ring! The size is perfect and the workmanship is so fine and gorgeous! I have not stopped staring at this gorgeous ring! 10 stars! luxury ring! this shop all decoration high quality are very beautiful! recommend!! shipping two weeks. beautiful box. ring is very cute, mechanism of work, all rhinestones. think neat and need to wearing infrequently, there are so feedback облезает that. courier delivered home ring was very good and packed in box, all stones in place, glittering and very beautiful, slightly gear крихтит. advise to order. simply wonderful, valley every penny, shipping and delivery super fast, excellent seller, highly recommend. very nice and fast shipping seller recommend! thank you so much seller!!!! gorgeous ring!!! покоряет general 2 weeks shipping. now ll only you order jewelry. satisfied and speed and quality. very beautiful ring! looks very expensive, glittering gems, good. as the elephant satisfied!! ringlet extraordinary, ringlet it fell in love at first sight. fast shipping. recommend this store!!! elegant ringlet! made surprisingly very neatly, small stone, shiny, smoothly and order in strict glued and luxurious design .. expensive! it is fast! 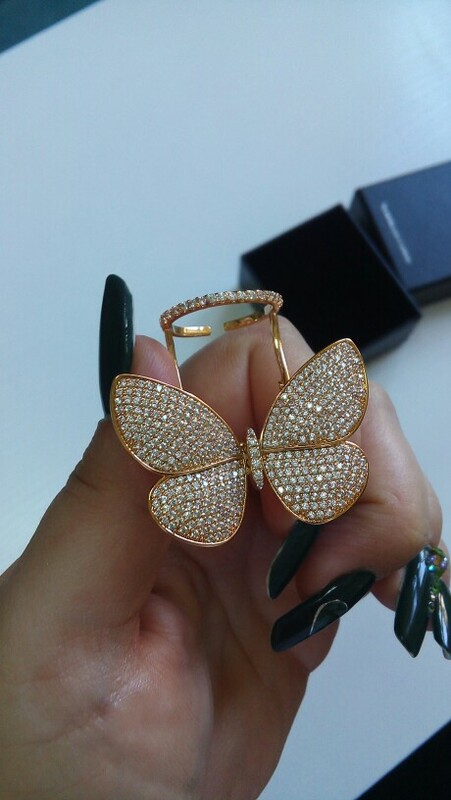 do not wear jewelry general, but look this ring precious) thank you very much seller! thank you! fast shipping калининграда up. thanks for good packing and! very beautiful. took 17,5 8. sitting freely. woow! best imaginaba you me! beautiful you seen this RING Is More photo. Is bellísimo! good quality. i am happy More compraré INSURANCE This Purchase and fashion! arrived pointed poco! free shipping recommend! came in 2weeks! perfectttt! advise!! !